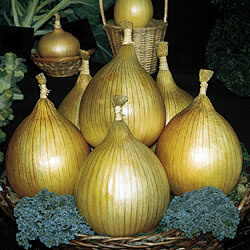 Capable of growing to more than 7lb when pampered it produces bulbs weighing 1lb with the minimum care. Bred by Unwins this very large strain has a mild flavour and is wonderful fried or used in salads and sandwiches. Our community of gardeners have a wealth of experience, beautiful garden and great photos, discover more on the following pages: winter vegetables, grow your own, onions & shallots.